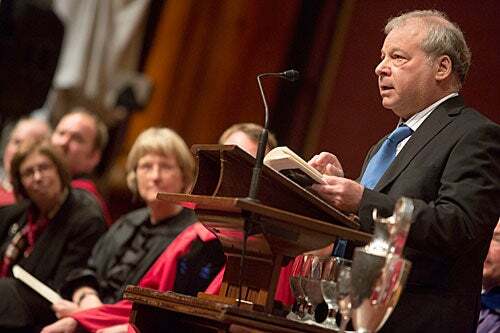 The Phi Beta Kappa Literary Exercises, a tradition at Harvard since the 18th century, are an intellectual stereopticon, a dual taste of the literary. There is an address by a poet and another by an orator. For the 223rd Phi Beta Kappa Literary Exercises the weather was sunny, with a chance of fame. The PBK Exercises, a tradition at Harvard since the 18th century, are an intellectual stereopticon, a dual taste of the literary. There is an address by a poet and another by an orator. 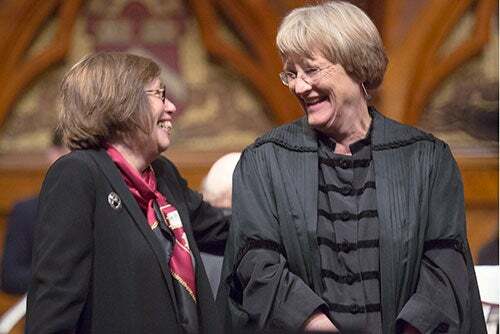 Harvard President Drew Faust (right) chatted with Linda Greenhouse ’68, who gave the day’s oration. Greenhouse, a PBK graduate of Radcliffe College, covered the Supreme Court for 30 years for The New York Times. The onetime Crimson writer won a 1998 Pulitzer Prize, was feted by seven of the nine justices at her 2008 retirement, and is now the Knight Distinguished Journalist-in-Residence at a certain law school in New Haven. If the two shared one message, it was: Look at the world the way it is. Greenhouse declared she would defy the historic topic of PBK addresses at Harvard — policy — and talk about personalities instead. Among them: Justice Sonia Sotomayor, who was elected to PBK at Princeton but had no idea what it was; and Justice Harry Blackmun, a 1929 PBK graduate and the subject of a Greenhouse biography. He arrived at Harvard College in 1925, and for four years was too poor to go home on holidays. Greenhouse followed with an oration, “The Sentence and the Parenthesis,” which was blessed with an abundance of hope. Justice Thurgood Marshall died in 1993, removing the last of the court’s true liberals, she said — and the question became: “Would the court hold fast to its ideals?” Would those ideals become a “sentence” (primary) or a “parenthesis” (secondary)? The winners of the Alpha Iota Prize for Excellence in Teaching were also announced during today’s exercises. For more on the winners.